We hate to sound like an Old Testament Hebrew Prophet, railing against the evils of HDTV signal survey reporting pitfalls, but due to the fast approaching analog cut-off date, February 2009, it is time to review critical minimum requirements of HDTV signal survey testing reports. HDTV reception field testing does not require a Master Degree from an Ivy League Institution. With the aid of a rotor-mounted TV antenna and a calibrated Signal Level Meter (SLM) any field engineer can measure and record the signal levels of the desired HDTV stations, while observing picture quality on the TV monitor. On the other hand, by replacing the SLM with a high performance SPECTRUM ANALYZER, the reliability of the survey, the analysis of reception difficulties will enormously improve the quality of the Testing Report, placing it into the premium category. 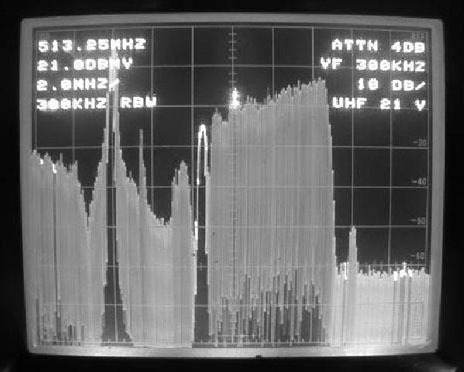 Only a spectrum analyzer can display co-channel interference difficulties, such as the presence of a -21 dB level, +10 kHz beat on Channel 4, as demonstrated on the picture on the left, or the high level, 5 MHz wide power spectrum co-channel beat clearly visible between the video and sound carriers of Channel 26. Adjacent channel interference is also a frequently occurring event in the extremely crowded UHF frequency range. 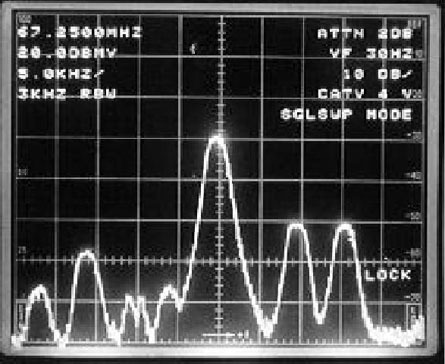 The heavy Channel 51 adjacent channel interference, displayed on the photograph below, could not have been detected and evaluated by a Signal Level Meter. 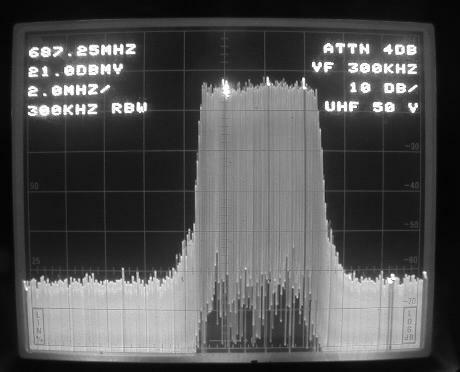 Another example: The frequency response of the 5.5 MHz wide DTV power spectrum affecting picture quality. 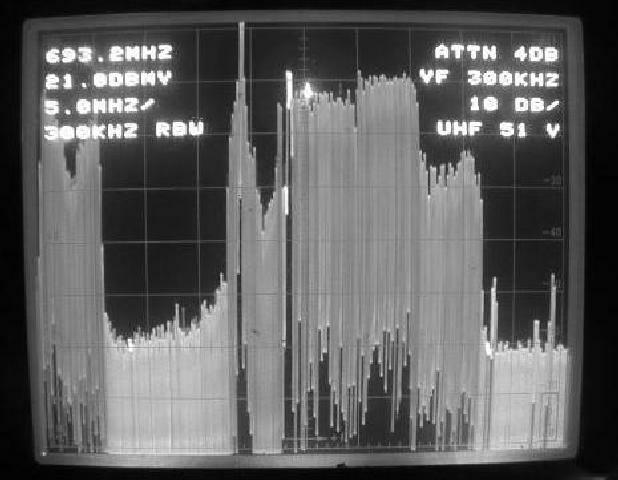 A perfect frequency response on the left side is in obvious contrast to the tilted one on the right, indicating multipath reception difficulties. IS CRITICAL TESTING REPORT INFORMATION MISSING FROM YOUR REPORT? A professionally prepared HDTV Reception Testing Report, without straight forward antenna recommendations and antenna-tower/antenna-array design is the same as having a checkup in the doctor’s office, but not receiving a prescription or warning about the possible side effects of the medication. Would you consider another appointment with that doctor? Minimum antenna tower height suggestion. Every antenna tower should have a rotor mounted search antenna, installed on the top of the tower, serving as a replacement unit or for interference identification purposes. You don’t have to be a distant relative of Sherlock Holmes to realize that the above shown inexpensive, rooftop type antenna, installed at the top of the 150’ antenna tower, will not survive a major winter storm. 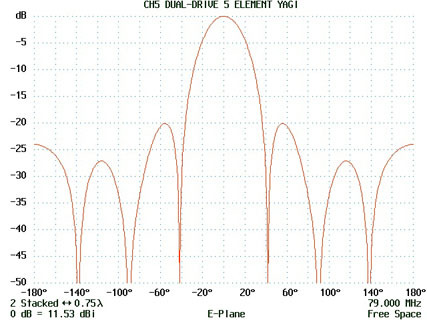 Nor is the gain and the frequency coverage of this antenna matching minimum CATV technical standards. Biro Engineering recommends the application of a 4’ diameter, ruggedized parabolic antenna, covering the 470 to 800 MHz frequency range. 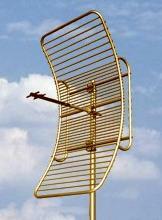 The light weight grid reflector construction will minimize wind loading, a very important tower safety consideration. CUT PARABOLIC antennas, despite their superb rugged construction and low price should not be employed. This antenna is a true parabolic in the vertical plane, but only a dipole and reflector combination in the horizontal plane. The result: an extremely wide horizontal radiation pattern, no protection against adjacent channel or co-channel interference. And last but not least, this model covers only a small portion of the 470 to 800 MHz UHF band, depending on the size of the dipole. 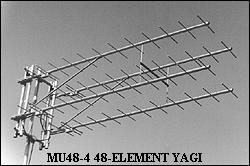 When one of the desired distant DTV affiliate station is not co-located with the rest of the UHF stations, the recommended antenna is a quad-array of 12 element Yagis. The high-gain (20 dB) and sharp radiation pattern antenna is easy to attach to the tower leg and represents minimal windload. No other design can match or surpass the directivity and antenna-gain of a parabolic antenna with prime focus feed. 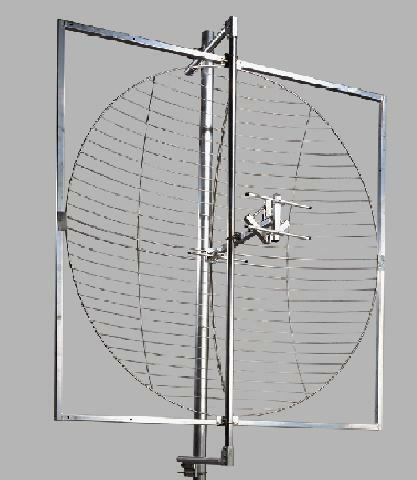 A properly designed 6’ diameter parabolic antenna should have a gain of 15 to 18 dB, depending on the desired channel, while the beam width is in the 20° range. True, the grid reflector construction will reduce its theoretical gain. On the other hand, the reduced wind load is an undisputed advantage of this model. 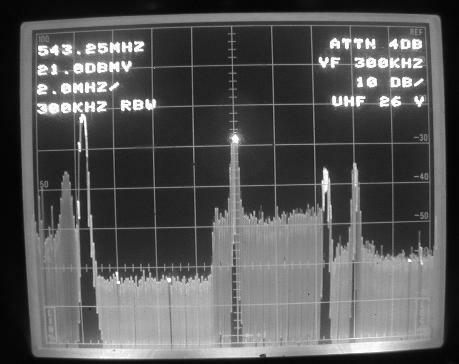 Under powered low-band DTV stations, (Channel 2 to Channel 6), are often exposed to severe co-channel interference, requiring the suppression of the offenders. 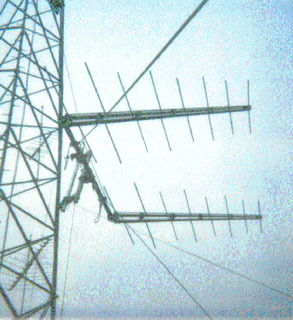 The two-bay array of horizontally stacked log-periodic antennas represents an ideal solution. 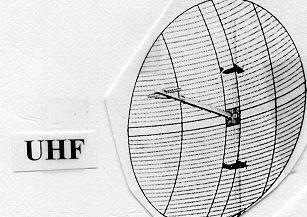 The picture on the right shows the rectangular radiation pattern of the horizontally stacked log-periodic antennas, producing several deep radiation pattern nulls, thus protecting the desired station against multiple interference sources. Make sure that there are reasonable vertical separations between the adjacent antennas and antenna-arrays. 10 feet is the bare minimum but 15 feet is highly desirable. Pay attention to the location of the starmount and guy wires. Their proximity can affect the radiation pattern of the antenna. Reserve space on the top of the tower for those antennas/antenna-arrays which are designated to receive the most distant stations. On the other hand do not place the antennas of local stations at an unreasonably high elevation exposing them to co-channel interference. Antenna heights, as shown on the tower design sheet, did not come from Mount Sinai. Let the tower crew move the antennas/antenna-arrays for the most practical location of the tower, free of guy line interference, mobile radio antennas or other obstructions. 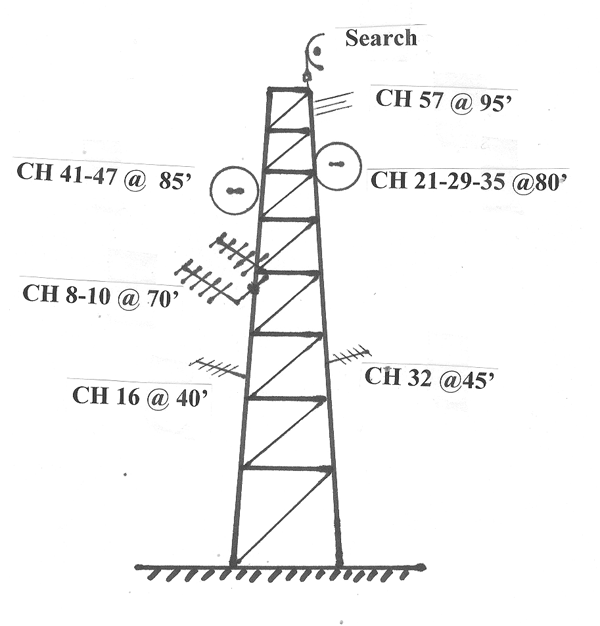 If you feel that the above listing is incomplete, you may obtain more detailed information by borrowing or purchasing THE CATV ENGINEER’S ANTENNA HANDBOOK, Second Edition, and glance through Pages 113-127.